Looking for healthy smoothie recipes? 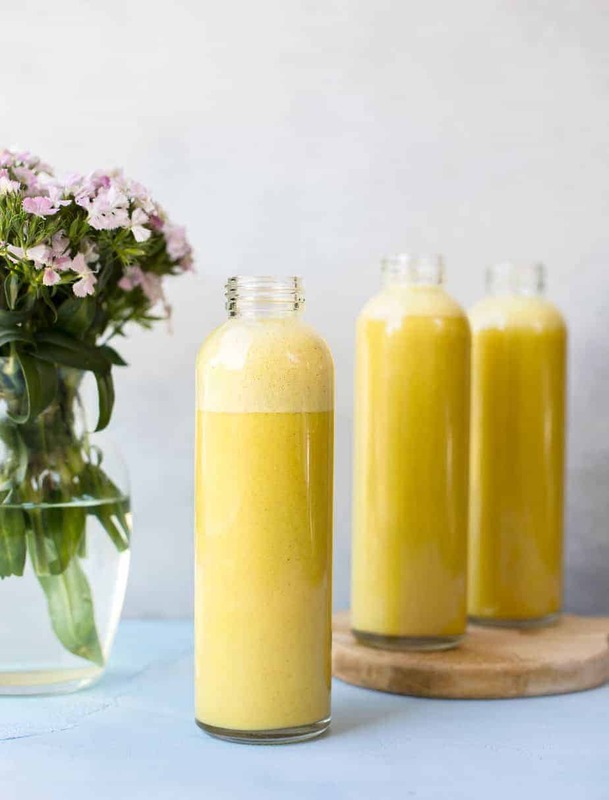 Try this Anti-inflammatory Smoothie, Orange Pineapple Protein Smoothie with Turmeric Powder and lemon. It has probiotics and prebiotic fiber, and no added sugar. 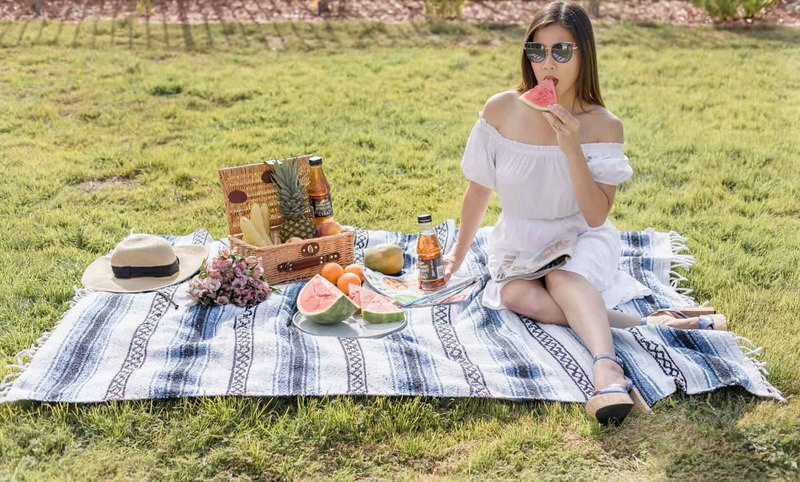 It is also a protein smoothie that will keep you fueled during your summer activities and offers a ton of health benefits: immune system support strengthened bones and does wonder for the eyes and skin. It can help with digestion and If you are looking for a meal replacement smoothie, snack, or just a post-workout recovery drink then look no further. One of the main key ingredients of this Orange Pineapple Protein Smoothie is Bob’s Red Mill Vanilla Nutritional Booster, a plant-based wholesome protein powder with an excellent source of protein (20g per serving), fiber, probiotic and prebiotic fiber. It’s also gluten free, vegan, a good source of omega-3, and iron. Bob’s Red Nutritional Booster is becoming my new favorite protein powder because it’s easy to blend in shakes and smoothies like this one and enhances the taste, whereas many other protein powders detract from (or completely ruin) the taste of a drink. To add to that, with other powders you have to drink it right away after blending and even then it doesn’t break down that well or take to the other ingredients, which then contributes to that chalky taste sensation that I personally dread. Bob’s Red Mill products are very different in that they break down to a better consistency. It comes down to the ingredients, which brings up another huge differentiator in that Bob’s Red Nutritional Booster uses Monk fruit as a natural sweetener. Delicious! This may very well be the best tasting smoothie I’ve ever made and I’m confident that most of you will love it. Picking the right booster is essential, as is making sure you choose a ripe pineapple. To do so, tune in with your senses: smell the pineapples and choose the one that has a sweet scent. It should be heavier than others of similar size, as those are juicier. Squeeze them to find the one that is just firm enough, and of course look at the pineapple’s color. This is the latest of many turmeric recipes that I’ve posted and will continue to post. The more I learn about its benefits the more I’ve blown away. Depending on the amount of turmeric you add it can bolster the taste of an entire dish or, as is the case with this smoothie, just give it a slight hint of flavor. My son is not a huge turmeric fan (yet), but he drank this smoothie down and asked for more. On that note, this is a kid-friendly smoothie and can be easily modified around someone’s preferences. SAVE $3 ON ANY BOB’S RED MILL NUTRITIONAL BOOSTER! Put all the ingredients in a high-speed blender. Blend for about 15 or 20 seconds and serve. Put all the ingredients in a high-speed blender. Blend for about 10-15 seconds. This sounds delicious! We make a smoothie for breakfast every morning. I’ll have to check out this new powder to add to them. I didn’t know that Bob’s made protein powders. I’m using something off of Amazon because it is rather cheap to buy in bulk, but then I’m limited to only one flavor. I had no idea Bob’s Red Mill made a protein powder. I think I would definitely try the chai. I love smoothies for breakfast and have used protein powders in the past. But I had no idea there was such a variety of nutritional additives available. I’ll definitely have to look into these when I’m back in the States. 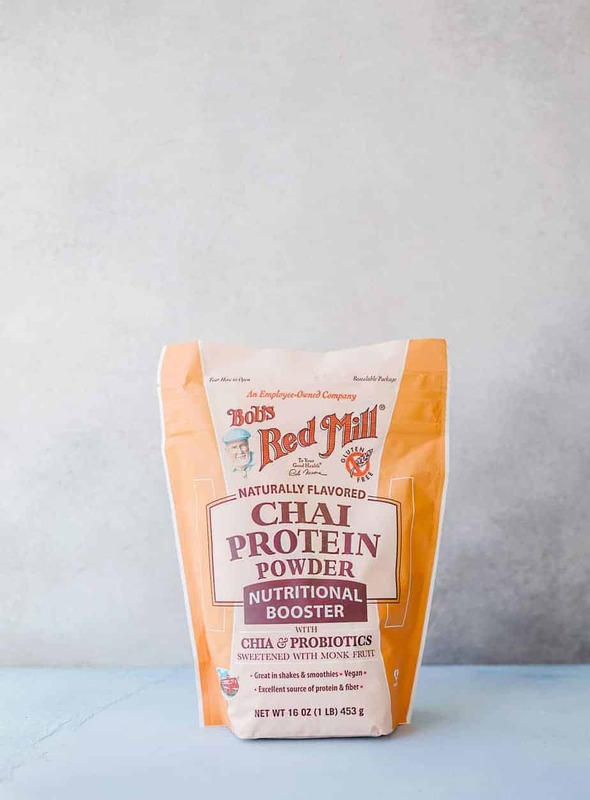 I also had no idea Bob’s Red Mill made protein powder and especially not a chai flavored one (I love all things chai). Plus, I love the combination of orange and pineapple so I have no doubt that I would really enjoy this recipe. These look like great protein powders! I’ve really been getting into smoothies – they are such a good way to get in fruits & veggies. I think you’re going to love this protein powder. Very easy to blend! 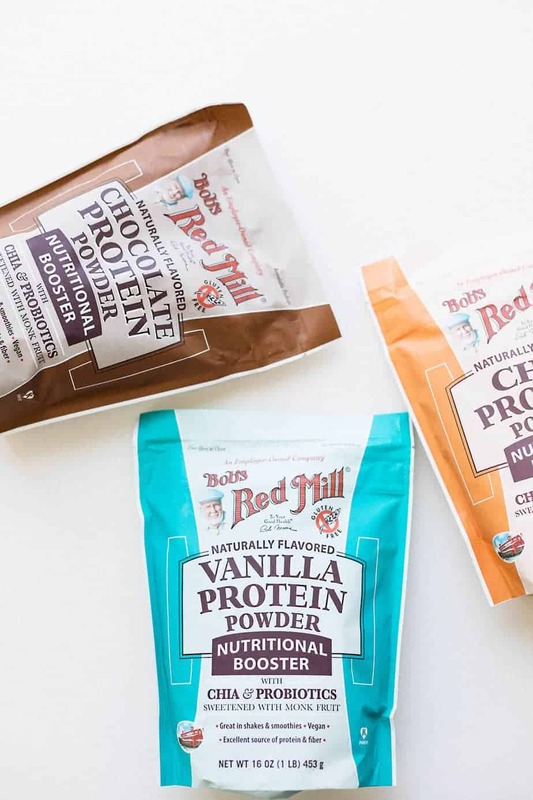 Bob’s Red Mill makes protein powder?! I had no idea! Also, that smoothie sounds absolutely delicious, I’m definitely going to look into making one! That Orange Pineapple Protein Smoothie looks super delicious. Pineapple is my go-to summer fruit (it’s just so yummy) and I’m always looking for new pineapple drink recipes. I can’t wait to try this out. Bob’s Red Nutritional Booster products I have not heard of before but they sound amazing. 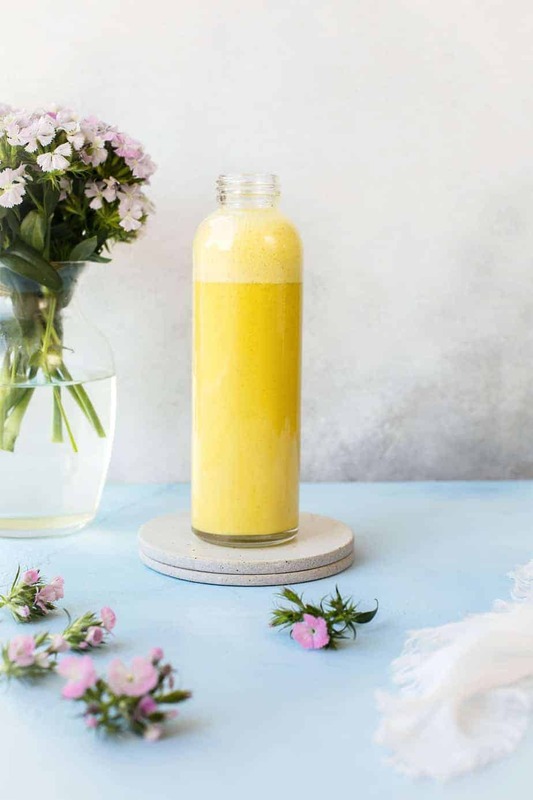 The orange pineapple protein smoothie with turmeric powder I will have to try making for sure. My sons will love this smoothie and the Bob’s Red Nutritional Booster products which are gluten free. Thanks for sharing the products and the smoothie recipe. I had no idea that Bob’s Red Mill made protein powder. We love their flour mixes. Thanks for the tip! We love Bob’s Red Mill products and pineapple so I need to try this. Thanks for sharing this wholesome recipe, I need to make this for my busy days! I really like mixing pineapple juice with orange juice because it reduces the drink’s acidity. Nice idea to use this combination in a protein drink. I am always looking for ways to get more protein into my diet. This smoothie looks delicious. I will have to pick up some Bob’s Red Mill Vanilla Nutritional Booster to try. Sounds like a healthy, refreshing, and delicious smoothie! I’d love to try this. It has a lot of nutritious benefits. Smoothies are something I am trying to incorporate more in my diet. I need to give this one a try! I am familiar with Bob’s because of a friend of mine who adores the products. I’ve never heard of this though! I will have to see if she’s aware of this product through them! Yum! I love a good smoothie in the mornings. The combo of orange and pineapple sounds absolutely scrumptious. I like that you added turmeric too! That vanilla nutrition booster sounds like a great thing to have in your kitchen. I usually don’t like to add protein powder to my smoothies but I may give it a shot. Your smoothies looks delicious! I love that these powders are gluten free! I am always looking for a great protein powder that won’t make me sick! I really love trying new products and I love smoothies because they are delicious and so filling. I have not tried orange-pineapple, and I wish we had these products available here in Austria. This looks so refreshing and delicious!